Dr. Hilary Jones also appeared on the same segment of Good Morning America and implied that some lives, like Charlie’s, are not worthy of living. When Chris Gard and Connie Yates first began fighting for their son Charlie’s life, Estopinan and his wife Olga put them in touch with a doctor who had helped their son, who was the first to receive the experimental treatment called nucleoside therapy in the United States. Though the Gard family is in the UK and the doctor is in the United States, Charlie’s parents decided to do everything they could to get their son to the US, even raising over 1.3 million pounds. But now, at the end of their legal battle, the courts have decided to allow the hospital to choose what’s best for Charlie, which, in their opinion, is to turn off his life support. Estopinan said that he is grateful to be in the United States, because if he had been in Britain like Charlie, he believes his son would be dead. 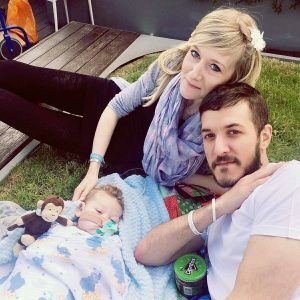 Connie Yates and Chris Gard enjoy a picnic with their son Charlie Gard. Like Charlie’s parents, doctors told Estopinan and his wife that there was no treatment or cure available for their son, who was born seemingly healthy until he was about 14 months old. Arturito was originally believed to have the flu, but after being admitted to the hospital, he was placed on a ventilator and his health began to further decline. The parents saw a change in Arturito within three months. Six years later, Arturito continues to get stronger and he is able to communicate with head movements and clicks of his tongue. He has regained strength in his muscles and is now able to smile again. Arturito enjoys trips to the zoo, to Broadway shows, to the beach, and to the movies. “Nobody can deny the miracle that is before our eyes,” said Olga Estonian. Despite the proof that the experimental nucleoside bypass therapy has helped Arturito and others, the courts in the UK sided with the doctors at Great Ormond Street Hospital where Charlie is currently on life-support. Doctors were orginally going to end Charlie’s life-support on June 30, 2017, but after refusing his parents’ last wish to bring him home to die, have decided to give Yates and Gard more time with their son.